I am a die-hard New York Mets fan and have been since I was a child. It was my Father, Great Aunt and Uncle (former New York Giants fans) who started bringing me to Shea Stadium to see the Mets and started my love affair with the team. Please see my tribute to Shea Stadium. If you are a Mets fan and would be interested in purchasing a copy of my photo (Waking Shea) from the closing ceremonies at Shea Stadium. I can provide the following sizes 8×12 ($25) and 20×30 ($50) shipping included. Contact me for details. Click on photo for a larger view. Times change and it’s time to start a tribute to our new home, Citi Field. Here’s where you can see my new Citi Field tribute. #3 April 3, 2009 – The 1st Mets game: an exhibition game vs. the Boston Red Sox. 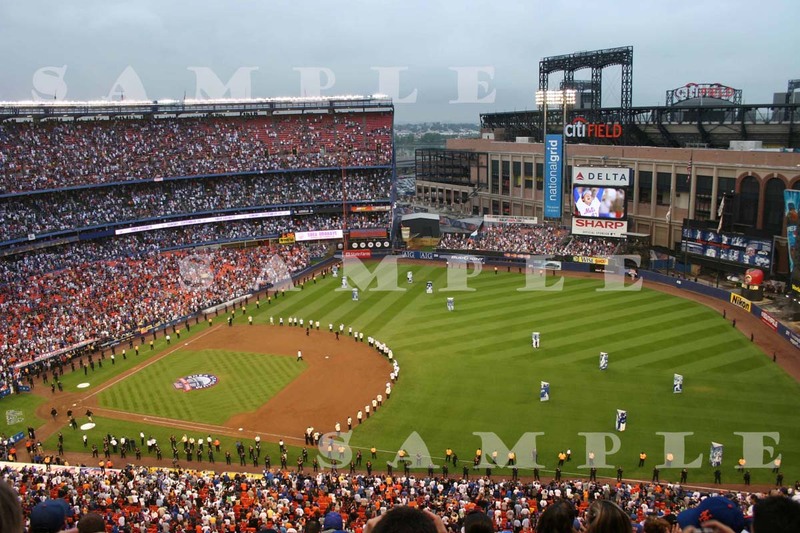 #2 April 13, 2009 – The 1st Opening Day game: Mets vs. the San Diego Padres. #1 June 1, 2012 – Johan Santana throws Mets 1st no-hitter vs. the St. Louis Cardinals. #10 October 3, 1999 – The Mets beat the Pirates, 2 to 1, in the tenth inning on a wild pitch to force a one game play-off with the Reds for the Wild Card. #9 August 20, 1998: Seeing Mark McGwire hit #50 & 51 en route to 70. I’m still waiting to see Piazza’s moon shot land. #8 August 4, 1991: Setting foot on the turf on Banner Day. #7 May 5, 1984: Catching my first baseball at a Major League Baseball game. It was pitched by Ed Lynch and fouled off by Jerry Mumphrey. #6 Tie August 25, 1999: Completing a day-night doubleheader, seeing the Phillies beat the Padres 15 to 1 in the afternoon at Veteran’s Stadium in Philadelphia and the Mets best the Astros 4 to 0 at Shea that same night (not really a Mets “moment” but it was “cool”). July 13, 2008: Return of the day/night multi-city doubleheader. This time seeing Met killer Pat Burrell hit a 3-run homerun in the bottom of the 8th to lead the Phillies to a 6-3 win over the Diamondbacks at Citizen’s Bank Park. The Mets completed the doubleheader defeating the Rockies 7-0 on a brilliant pitching performance by Mike Pelfrey. #5 2000 NLDS Game 3 – Benny Agbayani’s game winning homerun in the 13th vs. the Giants. #4 2000 NLDS Game 4 – Bobby Jones’ one-hitter to clinch the series. #3 May 13, 2000 – Celebrating my 40th birthday with a bus load of my friends and the Mets. #2 July 3, 1986 Fireworks Night: Darryl Strawberry (2-run shot) and Ray Knight (solo) hit back-to-back homeruns in the bottom of the 10th inning to win the game 6 to 5. Then the real fireworks started. #1 1999 NLCS Game 5 – Robin Ventura’s Grand Slam Single in the 15th inning vs. the Braves. My worst moment? Of the three worst Mets losses witnessed in person, two were at Shea Stadium and one was at Citi Field. By far the worst was NCLS Game 6 on October 12, 2006 when Yadier Molina hit the homerun that over shadowed Endy Chavez’s great catch and kept the Mets out of the World Series. Ending with the tying and winning runs in scoring position on a Carlos Beltran caught looking to end the game. This started the Mets into a downward spiral for years to come. The next was on September 11, 1987, when with the crowd chanting “Na Na Na Na, Na Na Na Na…” and one out away from a victory, Willie McGee’s game tying hit and Terry Pendleton’s 2 run shot off of Roger McDowell, dashed the Mets play-off hopes. The third worst game played out in the new Citi Field on August 20, 2011 when the Mets clawed their way back from a 7-1 deficit with 5 runs in the 7th and 3 runs in the 8th capped off by a 2 run homerun by Angel Pagan off of former Met K-Rod to take a 9-7 lead into the 9th. Only problem was that Jason Isringhausen decided to walk 3 and give up a hit to fuel a 4 run 9th inning for the Brewers and the Mets were left with a 11-9 heartbreaker. My most bittersweet moment? Another Tie. In 2000, returning home from vacation in California (saw the Mets in LA and San Diego) found a message on our answering machine notifying us that our family was selected as a finalist in the Most Amazing Mets’ fan contest. Problem was that we had returned after the deadline for returning the call. However with an impassioned call explaining our circumstances, we were allowed to remain in contention. It was fun. We had a screen test at the stadium, went to a game, but alas did not win. The experience alone was worth it. Since we only received two free tickets, and it was a family affair, I purchased two additional ones and the Mets were nice enough to keep all four tickets together. The only problem was that we weren’t seated next to the other finalists and therefore, weren’t included in the group photo. Wouldn’t you know it, that photo ended up in the NLCS and World Series programs. We missed an opportunity to be connected with Mets history. The closing ceremony following the devastating last game of the 2008 season, the last in Shea Stadium history. I still can’t write much about it. Finally, rather than a single moment, the several visits watching the deconstruction of Shea. As we long time Mets fans say, Shea may have been a dump, but it was OUR dump.